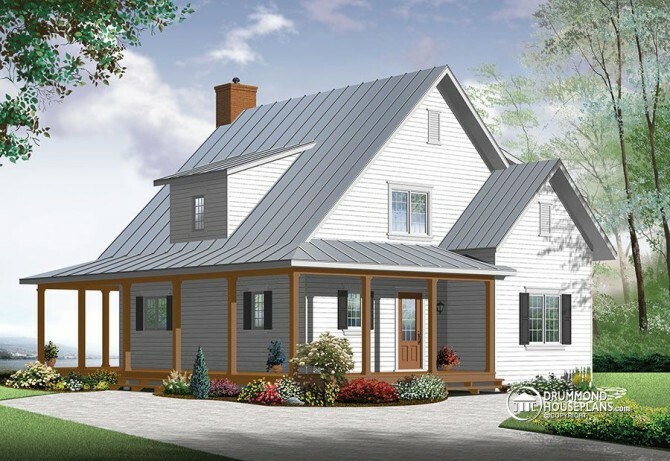 Here’s our latest & new small & affordable modern farmhouse house plan # 3518-V1, The Hickory Lane 2, with an irresistable Veranda! An enlarged version of plan 3518, this new farmhouse home model benefits from even more country charm than its smaller cousin. A modern farmhouse cottage with great charms! A wraparound veranda is what first catches your eye. Within, we still find all of the convenience of single-level living for the homeowner with a master on the main and spacious bathroom with independent shower, soaker tub and laundry. The rear-oriented activities area features a vaulted living room, double sided gas fireplace and country kitchen. Upstairs, we find three bedrooms and a full bathroom and a mezannine overlooking the living room. Need some changes to this modern farmhouse floor plans? It would be easy to make some changes to this floor plan, like adding an ensuite to the master bedroom, or a two car garage, or anything else you desire. If you need any changes to this home, or any home in our house plan collection, please contact our customization dept. and get a FREE cost estimate for your plan modifications! An ideal home for building cherished memories for the whole family! I love it! How much does it cost? Thanks for your comment and sorry for the delay in writing back! For the price, you may want to look into this with a local builder. They are usually well experienced and would most probably be able to give you an approximate cost per square foot. Hope this helps you out! Looks great and just right type of houses for Surrey, BC. Thanks for sharing this. A farm house should be eye catching and should be build by a professionals. The mentioned farm house looks great. Thanks for sharing the article. Waiting to build this plan. … post Valley Fire. Our lumber yard couldn’t use the material take-off list. Plan on spending extra to have plans modified locally to meet codes.